Women’s rose gold-toned ‘Modern Sport Logo Face’ wristwatch from American design house of modern luxury accessories, Coach. 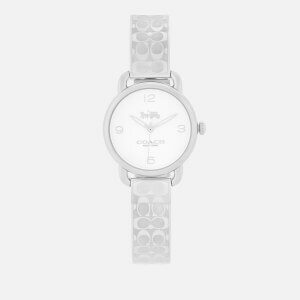 Encased in a stainless steel case with a crystal-embellished bezel and scratch-resistant mineral crystal, the watch features a round dial decorated with a debossed Coach logo pattern on the face. Detailed with rose gold-toned hands, crown, lugs and quarterly stud markers. A stainless steel bracelet with a pushbutton deployment clasp secures the sleek analogue timepiece to the wearer’s wrist. Functioning on a two-hand Japanese quartz movement, the watch is complete with subtle Coach branding etched to the caseback and clasp. Presented in a branded gift box.